Coming off a Grammy win earlier this year for his last album, Past Present, John Scofield's impressive 40-plus-year career has seen the guitarist masterfully tackle multiple genres as well as several eclectic collaborations with everyone from Grateful Dead bassist Phil Lesh, to Government Mule and Medeski, Martin & Wood, not to mention his own groups. Next up is an exploration into roots music with 'Country For Old Men' on Impulse!/Verve Label Group. The release is an homage to such greats as George Jones, Dolly Parton, Merle Haggard, James Taylor and Hank Williams among others. 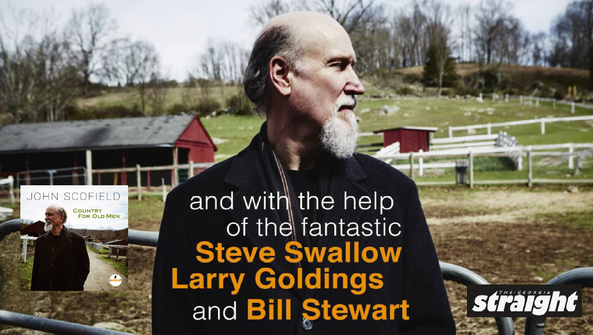 Colleagues - Steve Swallow, Larry Goldings and Bill Stewart, are on the date, and Scofield produced. Here are Best albums of the year 2016 compliments Alexander Varty for thegeorgiastraight. review: The punning title's no joke: the senior member of guitarist John Scofield's quartet, bassist Steve Swallow, is a spry 76. The concept-country songs given a jazz makeover-has also been around for a while, but trust me: once you hear Scofield and company tackle Dolly Parton's "Jolene" or Merle Haggard's "Mama Tried", you'll celebrate the wisdom of age.